Davis (knee/leg) believes he's seven months away from a full recovery and doesn't expect to be ready for training camp, Jake Kring-Schreifels of the Redskins' official site reports. Davis (leg, knee) will be placed on injured reserve, Kimberley A. Martin of The Washington Post reports. Analysis: Davis broke his leg and tore his LCL in Saturday's practice, so Sunday's move to IR is merely a formality. His recovery process will take 9-to-12 months, so there is optimism he will be ready for the beginning of next season. Look for Cam Sims and Simmie Cobbs to compete for Davis' spot at the bottom of the depth chart. A recent MRI revealed that Davis sustained a broken leg and torn LCL, ending his season, Ian Rapoport of the NFL Network reports. Analysis: The positive side of this is that he avoided both nerve damage and a torn ACL, which the team initially feared. Davis, who went down during Saturday's practice, is slated to undergo surgery in the near future and will be placed on injured reserve before long. His absence could create an opening for undrafted rookies Simmie Cobbs and Cam Sims to push for a spot on the 53-man roster. The initial tests for Davis (knee) suggest he may have suffered a torn ACL, Mike Garafolo of NFL Network reports. Analysis: Davis tried to leave the field on his own at Saturday's practice, but he ultimately required assistance, and apparently for good reason. A season-ending injury for Davis would improve the odds for Brian Quick (thigh) and/or Trey Quinn (stomach) to stick around on the 53-man roster. The Redskins likely will provide another update after Davis has an MRI. Davis was carted off the field during Saturday's practice after suffering an apparent right knee injury, JP Finlay of NBCSports.com reports. Analysis: Davis attempted to limp off the field after going down in 7-on-7 action, but trainers were ultimately needed to assist him to the locker room. Washington's receiving corps continues to be hampered by injuries, with Jamison Crowder (groin), Josh Doctson (shoulder), Brian Quick (thigh) and Trey Quinn (stomach) all dealing with issues of their own. 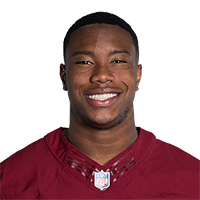 Davis (undisclosed) was healthy for the Redskins' minicamp practices earlier in June and appeared much improved from last year, Rich Tandler of NBC Sports Washington reports. Davis (undisclosed) is unable to participate in Wednesday's practice, John Keim of ESPN reports. Analysis: Davis is reportedly present at the team facility, but it isn't clear why he isn't participating. The 2017 sixth-rounder is currently competing with a slew of other depth-caliber receivers for slotting under the Redskins' top trio of Jamison Crowder, Paul Richardson, and Josh Doctson. There are no videos available for Robert Davis. Click here to view all videos.